High-end TV’s with top of the line technologies were showcased during the Las Vegas CES 2012. The new offering from Samsung comes with Smart Interaction technology that allows the gadget to actually response to users! The television will no longer be controlled via a remote control alone. 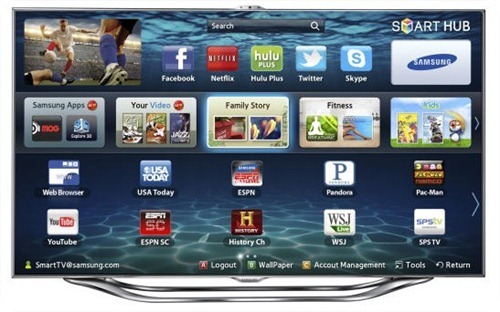 With the new Samsung TV, the wave of a hand, a shout and other voice and gestures can actually make it respond. This Samsung TV comes with a microphone and camera on top of the screen and a gesture and voice recognition software. The system initially allows in-menu operations of Smart Hub connected to the TV platform. It controls TV menu, volume and channel surfing. A representative waved a hand during the show to navigate through the menu and says “search for 30’s rock” to demonstrate the functionality of this brand new Samsung TV. What more, chat addicts can install the Skype app on the TV and buy an external camera and speakerphone especially built for Skype and they can instantly use the big screen television for video calls. The Skype accessories are currently priced at $170.